November 14th, 2017, Charlottetown – A trio of P.E.I. speed skaters came up with strong placements and set a bundle of new seasonal best and personal best times at a competition in Lévis, Q.C. this past weekend. The Island skaters were among 116 competitors at the second Quebec Provincial Series meet of the season. 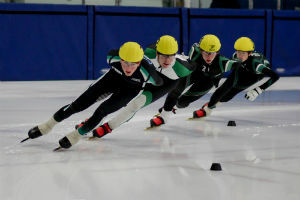 Island speed skaters Peter McQuaid (left), Andrew Binns (2nd from left) and Kyle Connell (2nd from right) racked up strong results at a recent competition in Lévis, Q.C. Also pictured is William Lyons. Photo courtesy of Kristen Binns. Charlottetown’s Peter McQuaid grabbed an eighth place finish in Group 1, after posting new personal bests (PBs) in both the 500 metre and 1500 metre distances, with times of 45.12 seconds and 2:24.13, respectively. McQuaid’s top finish came in the 3000m points race, where he nabbed fifth place in the A final. Kyle Connell of Charlottetown and Andrew Binns of Stratford placed seventh and eleventh, respectively, in Group 3. Connell skated in a pair of A finals, grabbing third place in the 500m sprint, while notching new personal bests in the 500m and 1500m distances. Binns posted a large PB time in his 500m distance, along with a seasonal best in the 1500m event. Both skaters are in their first year of eligibility for the Quebec circuit. Up next for Island speed skaters is the Atlantic Cup Speed Skating Championships, to be hosted at the Eastlink Centre in Charlottetown on Nov 25 & 26. Organizers with Speed Skate P.E.I. expect a strong field of competitors from at least five provinces as well as from the northeast United States.